CFA Societies Chicago, Madison and Milwaukee invite you to join us for the 2018 Golf Outing being held on June 11th at The Straits at Whistling Straits. This is an event not to be missed. Ranked one of Golf Digest's Top 25 Greatest Golf Courses of 2017-18, this year's course is set to host the 2020 Ryder Cup! **The package includes one night accommodation at The American Club on June 10th only (single or double occupancy, while inventory is available). This rate can be extended an additional night based on availability, at your own expense. Check-in time is 4:00 pm, check-out is prior to 12:00 pm. Complimentary and mandatory valet for all guests. 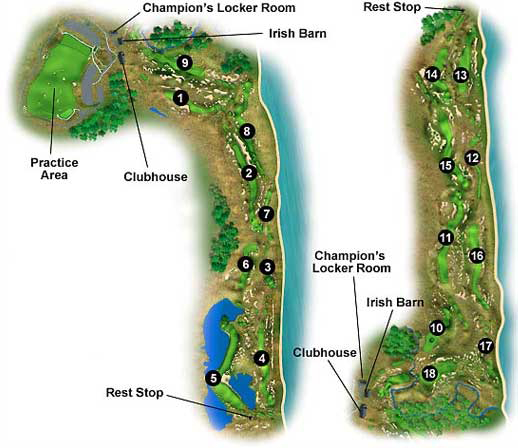 Price includes: Practice facilities, locker room facilities, breakfast, green fees, caddies and gratuities, 1 beverage on course, and lunch. Stay & Play package also includes guest room and 1 hour cocktail reception. Registration: Online Only. No phone calls please. Note: Space is limited. CFA Society Chicago, Madison and Milwaukee members may only bring 1 guest (member or nonmember). Nonmembers may only attend as the guest of a member registered for the event. Limited sponsorship opportunities remain. For more information, access the 2018 Annual Golf Outing Sponsorship Brochure or contact Kim Augustyn at sponsorship@cfachicago.org. Credit card required to guarantee ALL reservations. Visa, MasterCard, American Express, Discover and Diners Club are accepted. Golf Cancellations accepted until 5:00 pm, April 30, no refunds after this date. (Exception, if the event sells out and the spot can be filled, we can allow for a refund at that time). Hotel Cancellations accepted until 5:00 pm, May 17, no refunds after this date. In case of inclement weather and subsequent course closure, the golf shop will provide you with a pro-rated rain check based on the number of holes completed. Rain checks can be used for payment toward any future green fee, caddie fee or cart fee. Refunds will not be issued.